History is simply a collection of dates, events and often memories that are attached to them. For some Leeds fans, they remember all too well the memories attached to there great club. LEEDS UNITED FOOTBALL CLUB. 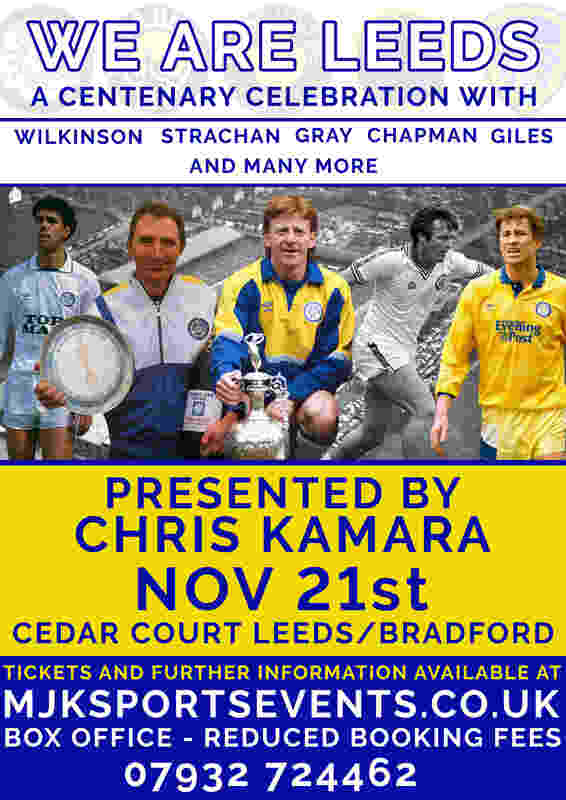 On Nov the 21st at the Cedar Court hotel Leeds/Bradford MJK SPORTS EVENTS are proud to bring you WE ARE LEEDS, a centenary event celebrating and taking a look back at 100 years of the great LEEDS UNITED. OUR VERY SPECIAL GUEST COMPERE, CHRIS KAMARA. VIP £99 Cat A Table seats on tables of 10. Two course meal and one of our special guests will be seated at your table. Includes a picture with a guest of your choice that will be printed on the night.